Dubai is a sleek and modern tourist destination that has become increasingly popular with holidaymakers from all over the world. The fact it can be reached in just five hours from many European airports also means this rapidly expanding desert city is an attractive option for a short break, with many people now jetting out to spend a weekend among its glinting skyscrapers. With so much to see and do in Dubai, people will find plenty of excitement to squeeze into a three-day stay. Dubai is famous for its retail culture, with a series of extravagant shopping malls enticing foreign visitors to part with their money. Although many of the designer outlets are no different to those found in other malls around the world, visiting one of these grandiose complexes is an experience in itself. The Dubai Mall is the world's largest shopping centre by area and features a three-storey aquarium at its core. Millions of people have visited its 1,200 shops since the mall opened in 2008. It stands next to the spectacular Burj Khalifa tower, which is the tallest building in the world. The Mall of the Emirates, located in the Al Barsha district, contains an indoor ski slope and snowboarding area with real snow as well as more than 500 international brands. After a busy morning's shopping, why not head to the Wild Wadi water park for some fun and relaxation? This great family attraction is situated next to the Burj Al Arab, the city's most famous luxury hotel. Based around the character of Juha from Arabian folklore, the outdoor park contains multiple rides and slides that are sure to delight both energetic youngsters and older thrill-seekers. Although staying at the world's only seven-star hotel may not suit the budget of many holidaymakers in Dubai, going there for afternoon tea is an experience not to be missed. A range of options are available for traditional English tea at the Burj Al Arab, with the spectacular views over Dubai adding to the sense of occasion. Booking ahead is essential though, as places are often reserved weeks in advance. Heading out into the desert is certainly a highly recommended option, even for those who are only staying in Dubai for a short time. A variety of desert safari packages are available to visitors, with specialist 4x4s driving them out into the sand dunes for an action-packed few hours. Many of the safari trips include camel rides, sunset photography opportunities, belly dancing and a barbecue dinner among the dunes. 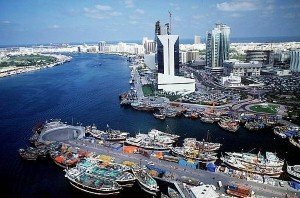 The saltwater Dubai Creek divides the city into its two main sections, Deira and Bur Dubai. With many of the bridges often busy with traffic, the best way to get across the creek and see some more of the city is by Abra (the traditional wooden boats used as water taxis). The trip is very cheap and should produce some wonderful photographs, particularly at sunset. For those who want to spend more time on the water, private boats can be rented for a more leisurely experience. People may want to spend their final day exploring the city's more traditional side. Although it is easy to get the impression that everything in Dubai is brand new and gleaming, there are still many pockets of the past for those who know where to look. The Bastakiya district, which lies along Dubai Creek, is one of the oldest residential areas in the city. Here visitors can soak up the atmosphere as they wander through the narrow lanes, passing the many courtyard houses with traditional wind towers.